The disagreement has ended with the discount supermarket giant committing to future grower viability. AN AGREEMENT HAS been reached between supermarket Aldi and the Irish Farmers’ Association over concerns raised by vegetable growers. Last month the IFA supported a protest held outside the headquarters of the discount supermarket in Naas, Co Kildare. 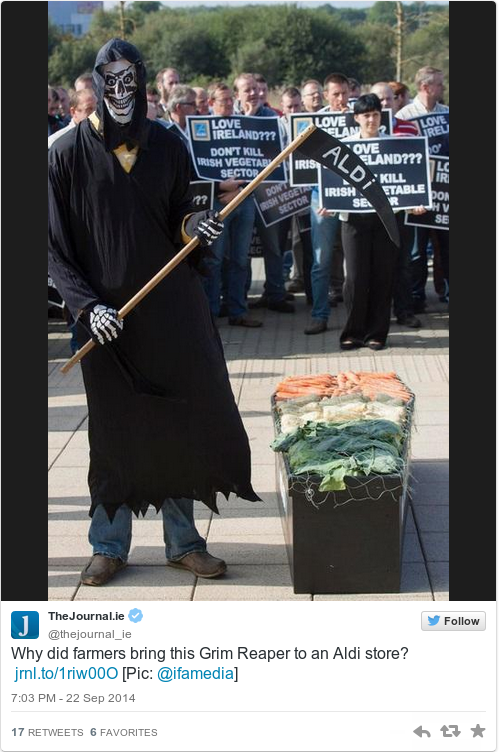 At the demonstration one protester, dressed as the grim reaper, stood over a coffin full of vegetables. The IFA protest was organised to protest against unsustainable pricing for Irish vegetable growers by supermarkets. Under the new agreement Aldi has committed to engaging an independent expert with insight to the Irish vegetable growing sector to ensure grower viability. The supermarket has also said they will strengthen the system of traceability they have in place. It will now include random checks on facilitators and growers to ensure the products they supply are Irish. In a statement on the meeting IFA president Eddie Downey expressed his satisfaction that the retailer had agreed check facilitators who supply the product to supermarkets to ensure they are contracting Irish farmers. Aldi would like to clarify a number of inaccurate claims made regarding its tender process, including that it has imposed cuts on farm gate prices of vegetables in recent years. Aldi is pleased to confirm that, on foot of the recent concerns raised by some farmers, Aldi held a constructive meeting with the IFA last week. During that meeting significant progress was made in dealing with all concerns raised. Aldi is confident that it has appropriately addressed this issue and looks forward to continuing its long-standing relationship with its Irish farmers, growers and suppliers into the future.